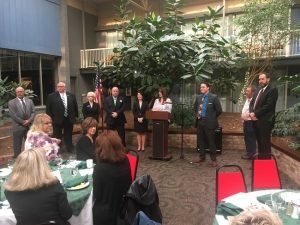 The Annual Spring Breakfast with the Candidates was held Friday at the Clarion Ramada Inn. 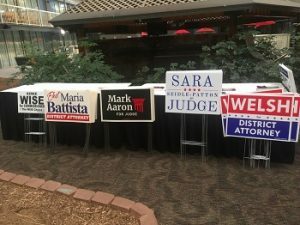 Over 100 people attended the open forum, where each candidate had five minutes to speak, with a question and answer session after the formal program. Ted Tharan, Ed Heasley, Maria Batista, Mark Aaron, Sara Seidle-Patton, Jen Keith – Clarion Chamber President,Erich Spessard, Kirke Wise and Drew Welsh. Not pictured Wayne Brosius. The event was sponsored by the Clarion Chamber of Commerce, the Clarion County Economic Development Corp., and the Clarion County Human Services Council.